Loudoun Habitat for Humanity * Gift Card Drive * Can you help? How cool would this be if we made it out of donated gift cards? Calling all friends, clients, and colleagues! We need your help! Ask Gina & Company, a Northern Virginia Real Estate Team is collecting gift cards for the 5th Annual Masquerade Ball for Loudoun Habitat for Humanity! 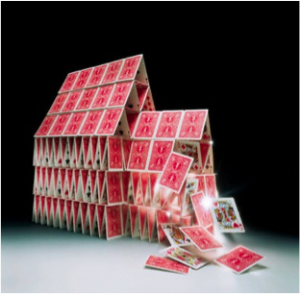 We’re going to build a “house of cards” for donation! Support the Northern Virginia community, the event, and the charity….please mail in or drop off your gift cards (you know, the ones sitting in your wallet that you never use, all denominations excepted) at the office (Keller Williams Loudoun Gateway, 20130 Lakeview Center Plaza, #110, Ashburn, VA 20147 – attention Gina Tufano) – we wanna build a HUGE house that will eventually become a home for someone in need of a hand up, not a hand out, in Loudoun County. Loudoun Habitat for Humanity was incorporated on April 2, 1993 for the specific purpose of providing adequate housing for all Loudoun citizens in need. It is the conviction of Loudoun Habitat for Humanity that everyone deserves an opportunity to work to obtain adequate shelter. Our ministry is based on Christian principles and we welcome the participation of people of all faiths as we grow the organization and strive to fund and build homes for those in need. For more information, or to donate or volunteer, visit www.LoudounHabitat.org.